Your trip to Malaysia will not be complete without stopping by the historical city of Melaka to explore the hidden treasures and adventures of the country that began from this state. Located just an hour away from Kuala Lumpur, Melaka offers a promenade of exciting cultural and historical landmarks that are a must visit. One such destination that you may want to consider visiting is the Christ Church. Located in the popular Chinatown centre, this is a popular tourist destination when visitors visit the Chinatown area. 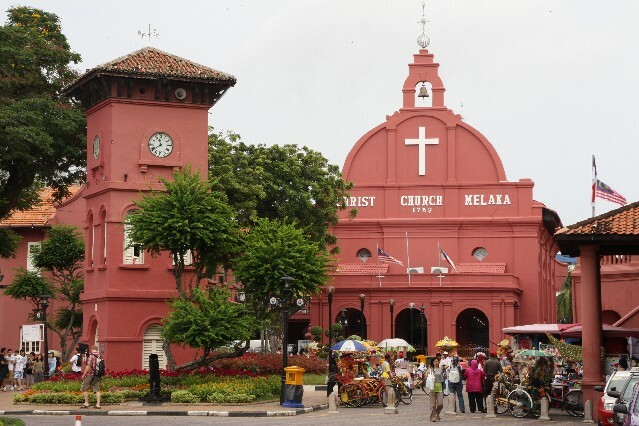 After making your way through the Jonker Street market, why not head down to the Christ Church. The church is slightly different from the other churches in Melaka and is definitely much smaller compared to the other churches in the area. The church building today is painted red. However, back in the day when the Dutch ruled over Melaka, the church donned a coat of white paint; as was the custom with other buildings built by the Dutch. When you step inside, you will be greeted by the usual banquet table that offers religious paraphernalia and souvenirs that may interest you. The setting inside the church has managed to maintain its old charm from the days when the Dutch colonized the state of Melaka. It was the Dutch who built the church, mostly as a commemorative symbol. The church was also used in the early 1700s as a place of worship for the Dutch and local believers. It certainly is an amazing feeling to walk down the aisle of such an old church building. The church is more than 250 years old and still holds services till this day. The pews in the church are very few; only about ten rows between the altars. The pews are the original set of pews that were installed into the church since it was constructed. Tourist to this place should also take a look at the church bell which was installed by the British when they ruled over Melaka. When the British took over the church, there were some minor reconstructions and large timber crucifixes still hang on the wall today. The church was originally a protestant one and when the British took over was established to be an Anglican church. It is nice to know that this is the church that the Queen of England; Queen Elizabeth the second chose to pray at when she visited Melaka in the late 1900s.